Not to be confused with Mercury Cougar, Ford Cougar, or AVGP Cougar. The new design was called Cougar to provide a degree of continuity with the older designs, but had little in common with them. The former vehicles were almost entirely non-compliant with NATO standards for protection, human factors and safety, which made those designs obsolete. The Cougar was effectively a totally new vehicle which incorporated the latest US-made automotives, a new hull design and structure, as well as built-in growth potential, including dimensions that allowed for the addition of the latest armor and protection systems. After being built, the first vehicle was only trialed by doing some circuits of the company campus and trundling over a few rocks and beams set up by the designer to provide a degree of shake-down testing as well as a demonstration course. Urgent operational requirements dictated that the first unit be shipped to theatre as fast as possible and those involved in the project decided that the risk of doing so was outweighed by the advantages of having the vehicle available. The Cougar was fully trialed when it became part of the MRAP program. As of December 2011[update], the Pentagon planned to add the Crows II remote weapon station and the Frag Kit 6 anti-EFP armor. Official data states that the Cougar is able to withstand a blast of at least 14 kg TNT (30.86 lb) under a wheel and 7 kg TNT (15.43 lb) under a belly. The Cougar comes in two main configurations, a 4×4 and 6×6. It is designed for the transport and protection of troops and equipment, especially against mines or IEDs. The two main configurations come in specific variants. 4×4 and 6×6 vehicles ordered in 2004 by the USMC. Based on the Cougar and manufactured by FPII and BAE Systems for the Iraqi Army. The ILAV is based on the Cougar, which can carry ten passengers (the six-wheel version can carry 16). The Cougar/ILAV vehicle uses a capsule design to protect the passengers and key vehicle components from mines and roadside bombs. The larger Cougar costs about $730,000 each, fully equipped. The Cougars have been very popular with American troops, and with Iraqis who have worked with them. 865 ILAVs were ordered by Iraq and 18 by Yemen. 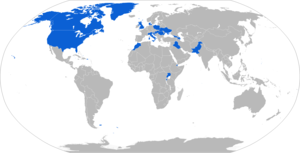 The ILAV gives the Iraqis the same degree of protection that most Coalition troops have. 4×4 and 6×6 variants for the US Army, USAF, and USMC. Approx. 200 ordered in 2005 and 2006, with another 200 ordered in late 2006 but now called MRAPs to take account of the new US military/political initiative to be seen to be responding to public concerns about casualties. Based on the Cougar 4×4, the ISS is fitted with an integrated independent suspension system that gives the vehicle increased cross-country mobility. British version of the Cougar 4x4 from FPII base vehicles with a British armor package and electronics, including installation of Enforcer remote weapon stations on some vehicles. In 2015, Salisbury coroner David Ridley raised several "points of concern" relating to the vehicle when recording a narrative verdict on the deaths of four soldiers who drowned in Helmand, Afghanistan in June 2010. British version of the Cougar 6×6 which arrived in Afghanistan during December 2006, with FPII providing the base vehicle and NP Aerospace in the UK integrating electronics and the British armour package. The Mastiff 2 is an improved version with a capacity of 2 + 8 which arrived in Afghanistan during June 2009. The Mastiff is armed with a 7.62 mm GPMG, 12.7 mm Heavy Machine Gun or 40 mm Grenade Machine Gun. A version of the British Mastiff specially designed for the Talisman Counter-IED program. It is fitted with an M151 Protector remote weapon station, mine plow, optical camera and a Micro Air Vehicle (MAV) with screens in the back to display its camera feed. British modification of the Cougar 6×6, with FPII providing the base vehicle and NP Aerospace in the UK integrating electronics and the British armor package. The first Wolfhounds entered service in Afghanistan in October 2010. 130 have been ordered for gun tractor and logistical roles. Cougar variant that was being marketed by Malley Industries of Dieppe, NB Canada for the replacement of the RG-31 and LAV for the Canadian Forces; Malley Industries lost the contract to Textron TAPV. Cougar 4x4 chassis fitted with the complete turret and main gun assembly of the Panhard AML-90 armored car. In service with the Djiboutian Army. Category I Cougar equipped with a U.S. Air Force-designed directed energy weapon, interrogator arm, console, and other features to clear unexploded ordnance from airfields. Burundi – Donated for Burundian forces in Somalia. Croatia – 4+ US Army donated several Cougar MRAPs to the Croatian Army ISAF contingent in Afghanistan. Denmark – 40 Cougar leased from US. Used in Afghanistan by the army. Djibouti – 12 for Djiboutian Army; some modified to accept 90 mm cannon and turrets adopted from Panhard AML armored cars. Georgia – 10 in service Georgian Land Forces. Also Georgian HQ units who are part of the ISAF are using the Cougar HEs in the Helmand Province. Iraq – Badger 378 ordered in 2007, another 865 ordered by 2011. Italy – Cougar HE used in Afghanistan by the Italian Army. Morocco – Unknown number of Cougar HE appeared in a Moroccan-Chinese movie shooting in Casablanca in which the Moroccan military vehicles were used. Pakistan – 20 Cougar JERRV (Buffalo Explosive Ordnance Disposal version) received from US under Coalition Support Fund in 2010. Romania – Used in Afghanistan by the army. Slovenia – Slovenian Armed Forces service, to be upgraded in 2017 and 2018. Uganda – Donated to Ugandan forces in Somalia. United Kingdom – 400 Mastiffs, 125 Wolfhounds and 160 Ridgebacks. The Cougar is used primarily by the United States Armed Forces and the British Army, as well as law enforcement agencies in the United States. 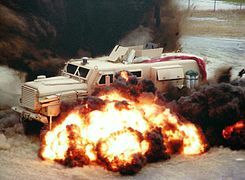 In service with those countries, the Cougar is used in a variety of roles, including the HEV (Hardened Engineer Vehicle) and the Joint Explosive Ordnance Disposal Rapid Response Vehicles (JERRV) while in service with the US Marine Corps, US Navy Seabees, and US Air Force RED HORSE. Compared to the original Cougar vehicle, the British variant is fitted with large, vertical armor plates which cover the large vision blocks and weapon firing ports. This is in line with British Army doctrine concerning the role of the APC/MICV, specifically that it is to carry troops under protection to the objective and give firepower support when they have disembarked. The Mastiff is fitted with a turret sporting either a L7A2 GPMG (General Purpose Machine Gun), L110A1 Light Machine Gun, L11A1 Heavy Machine Gun or L134A1 40 mm Grenade Machine Gun. One aspect of the British Army's approach to APC/MICV units (which differs to that of the United States) is that the ability of the average soldier to fire accurately out the ports of a moving IFV has been questioned. The large armor plates add side protection from RPGs or IED explosions. The British Army has operated an earlier MPV named "Tempest MPV". As of November 2008, the British Army has ordered over 400 Cougar vehicles for deployment in Iraq and Afghanistan following a series of Urgent Operational Requirements (UORs). Deliveries of the first 86 Mastiffs began in February 2007, and an order for 22 further vehicles was placed in March, bringing the total to 108. In October 2007, Gordon Brown announced a further 140 Mastiffs and 157 new Cougar 4x4 variants, named Ridgback were being ordered to protect troops from mines and roadside bombs. Canada has deployed the Cougar since October 2007 in Afghanistan. From November 2008, forty Cougar H were lent by the United States for the Polish contingent in Afghanistan. In Polish service they carried 7.62mm PK machine guns. 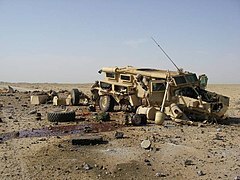 On Jan 5, 2012 an Air Force EOD Team, Team Tripwire, 3 Airman, were KIA by a remote detonated IED attack. A British Mastiff suffered an IED attack in Afghanistan in April 2013 which caused three fatalities. Iraqi Light Armored Vehicle at checkpoint. ^ a b c Cougar 4x4 specifications Archived 2007-08-13 at the Wayback Machine, ForceProtection.net. ^ a b Cougar 6x6 specifications Archived 2007-08-13 at the Wayback Machine, ForceProtection.net. ^ Cougar H Series 6x6, deagel.com. ^ a b "The truck the Pentagon wants and the firm that makes it". USA Today, 10/2/2007. ^ "Lights Out". Private Eye. London. 15 May 2015. p. 30. ^ "A Comparison of UK Sensor Turrets". ^ "'Flying Robot' pilot helps find IEDs in Helmand". UK Ministry of Defence. ^ "defence.professionals". defpro.com. Retrieved 2010-10-18. ^ a b Martin, Guy. "Burundi getting more Cougars – defenceWeb". www.defenceweb.co.za. ^ "SAD poslala Hrvatskoj vozila koja se prelako prevrću". ^ "Djibouti parades new armour". ^ "Armor: Cougars Cousin Badger Arrives in Baghdad". www.strategypage.com. 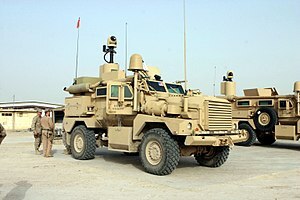 ^ "Italian Defense awards contract for MRAPs". ^ Bozinovski, Igor (20 December 2017). "Slovenia upgrades MRAP-JERRV vehicles". IHS Jane's 360. Archived from the original on 26 December 2017. Retrieved 26 December 2017. ^ "UK firms up UOR to core vehicle numbers". www.janes.com. 16 December 2013. Retrieved 18 December 2013. ^ In the News Archived 2007-09-27 at the Wayback Machine. Force Protection, Inc.
^ "Cougar Mine Protected Armored Patrol Vehicle". www.defense-update.com. ^ "UK Iraq troops to be cut to 2,500". BBC News. 2007-10-08. ^ Ouellet, Martin (29 August 2007). "Canadians get new bomb protection". Toronto Star. ^ "Afghanistan roadside bomb kills three British soldiers". BBC News. 2013-05-01. Wikimedia Commons has media related to Cougar (4x4). 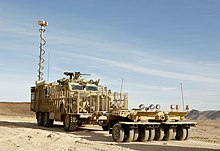 Wikimedia Commons has media related to Cougar (6x6). YouTube Video of "Future Weapons" episode featuring the Cougar.